The Grammy nominated volume one won plaudits for its inventive and successful attempt to redefine Monk’s compositions for the twenty-first century in a big band setting, and incorporating a variety of styles not normally associated with Monk. Volume two carries on the pioneering work and does a fine job of re-reading the Monkbook so to speak. Thelonius Monk recorded sparingly in a larger ensemble format and his best known album in this milieu is the 1959 Town Hall album, while a live performance from 1963 was captured at a New York Philharmonic Hall concert. What impressed this writer was how well researched Beasley has been in listening to previous attempts to interpret Monk and taking from these disparate sources. There is for example a nod to a late 1950’s Steve Lacy tribute to Monk on ‘Played Twice’, with soprano saxophone soloing from Bob Sheppard. Contemporary funk and rap feature on the opener, ‘Brake’s Sake’, with trumpeter Dontae Winslow then reverting to a rap commentary on Monk, and this clearly indicates that Monk is relevant to a younger audience. 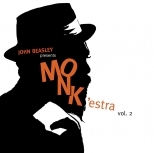 An Ellington-inspired big band reading of Monk is illustrated on various pieces, but no better than on ‘Light Blue’, which has a strong 1950’s feel with Beasley this time operating on organ and a fine tenor saxophone solo that is not indicated on the otherwise fine discographical notes. Guest musicians contribute to the bigger picture with violinist Regina Carter excellent on ‘Crepuscule with Nellie’, which is a a gentle mid-tempo take on the original with contemporary flavours. For some welcome vocal input, singer Dianne Reeves contributes, ‘Dear Ruby’, with a lengthy intro that includes leader Beasley on piano. 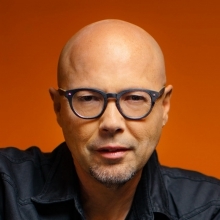 This writer would like to hear more of John Beasley the soloist on a separate project, but on other pieces he does stretch out on occasion. One minor disappointment is the muted contribution of Kamasi Washington whose fast-paced soloing on ‘Evidence’ backed by unison reeds, has precious little to distinguish itself and sounds muffled. In contrast, percussionist and bata soloist drummer Pedrito Martinez graces a Latin jazz take on ‘Criss Cross’, and this is, perhaps, a nod on Beasley’s part to the wonderful Jerry Gonzalez and the Fort Apaché Band album ‘Rumba Para Monk’, that is richly deserving of a second follow up album project. Inner sleeve notes by jazz journalist Neil Tesser place the project in a wider context.